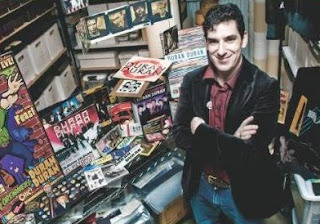 He hails from Seattle, Washington...a man on a mission...to add to his archive every piece of Duran Duran history he can find. He is the man...'Durandy' Andy Golub. If you've seen the movie 'Something You Should Know', you will see him in it. If you go to his website, you will be awed by his collection of Duran Duran throughout the years...ranging from posters to books to magazines to promos and rare photography. Andy says this about himself on his site..."For a long time I have believed that it’s best if I simply blend into the background as the archivist, working on finding new artifacts and keeping a low profile. However, fate has had other plans in mind. I’ve been fortunate to enjoy some terrific recognition for what I’m trying to accomplish, and I’m very grateful to find that others are so interested in learning more about how this collection came to be." When I first approached Andy, it was like it was meant to be. He was extremely excited about our effort and gracious in his support of it. If you look through the petition signatures...you will see his name there. Since then, I have had the joy of finding messages in my voice mail from Andy encouraging me in the DDTTRH cause and I have enjoyed a growing friendship with him. Andy has made news and caught the attention of Duran Duran in his efforts. He is known and loved by many in the Duranie community (including by myself). I am pleased to present to you DDTTRH's interview with Durandy. Andy: For over twenty years I have cultivated a relationship with the DJs at a local radio station. It began with me calling in and simply trying to raise the level of Duran awareness at the station. I'm not exactly sure whether it was the DJs who christened me Durandy or if it was a self-fashioned moniker, but the station soon realized I wasn't going away and my passion for the band translated into delicious sound bites on the air! I like to think it was fate that gave me a name perfectly suited for DD devotion. I've been asked about legally changing my name to Durandy. It would be great to take my passion that far but I believe I've put my poor family through enough as it is. Durandy Productions reflects how my archival endeavors have gravitated toward a mature, professional direction over the years. What began as a meager but determined collection in my bedroom has now blossomed into a comprehensive archive of the band's career. My collection has found purpose well beyond my personal satisfaction; from usage in television broadcasts and online web features to exhibits in the Rock & Roll Hall of Fame, I've enjoyed many opportunities to educate, illuminate, and commemorate the band's career. Mementos from Duran's past have intrinsic value that only continues to grow as new generations discover the band and lifelong fans strive to embrace their icons with fresh perspective. I adopted the name 'Durandy Productions' to solidify my archival efforts under a professional entity. Christine is a critical part of DP as her photography allows the archive to be enjoyed and fully utilized. A remarkable but lesser known aspect of Christine's contribution is her collection of Duran's audio/video releases. With thousands of vinyl pressings, CDs, cassettes, and videos, her archive stands alongside my own as a testament to Duran Duran's prolific catalogue. LOL! Being a part of M's film has to be one of my life's greatest thrills. It started in Costa Mesa, 2003. I had just seen the reunited band perform for the first time and I was delirious with euphoria, an absolute high that I know we can all relate to! There was a small camera crew outside the venue and spontaneous interviews were taking place. Fans were pouring their excitement out to the cameras and a friend of mine quickly got the crew's attention, insisting they talk to me. Once I was asked if I enjoyed the show, the floodgates opened and I held court right there on the sidewalk, gesturing like a madman, proclaiming my eternal love and admiration for Duran Duran. I was only reminded of what I had actually said when I saw the final cut of the film. The best thing about that moment was knowing there were so many fans who knew exactly what I was feeling. That's a powerful, emotional connection, and it helped ease the slight discomfort at seeing my dignity so easily surrendered in front of the cameras! But passion for Duran has always been worn on my sleeve and it apparently resonated with M Douglas. The next thing I know, I'm being contacted for a full interview and tour of the archive with a camera crew behind me. One of the most compelling motivations behind my archive is oriented around my connection to the global fan community. In light of that, becoming involved with M's film felt particularly meaningful as the documentary captures the common experience that draws us all together. I have never felt more proud to belong to such an amazing group of people. only recently appeared on the 'Duranie' scene. Andy: First of all, Kirk, I am dismayed to learn that you somehow judge yourself as a less worthy fan based upon your visibility within the fan community. It shouldn't matter when you started being a fan, how passionate you are in devotion, or where you choose to display your colors. We're all fans, all deserving of praise and props for impeccable taste in musical icons! Kirk, you are not only a genuine, worthy fan -- you inspire others to be the best they can be. Kirk, DDTTRH: What would you tell critics of the band who were so hard on them when they first started? Andy: I would tell them, thank you. Thank you for not making it so easy for the band to achieve critical success that they might have lost sight of how good it feels to overcome adversity, shatter expectations, and prove what they already knew: Duran Duran has what it takes to succeed regardless of critical opinion. If the critics weren't so hard on DD in the beginning, would the band have strived as hard as they did? It is rare to have success come without obstacles, and the obstacles allow us to feel triumphant for conquering them. Kirk, DDTTRH: Tell us about your newest effort with the independent film? you about Duran Duran and how have they touched your life? Andy: Thank you very much, Kirk. I have been asked this before and every time feels like a chance to answer differently, just because there are so many aspects about Duran that resonate with me. I'm sure every fan can relate to that! Right now, I'm thinking of the way the band lives their professional life, carrying lessons I learn from with each passing day. Duran's trajectory has been one of bold steps, never quite knowing what lies ahead, where they will end up, or how they will be perceived. With all editorial aside regarding management or record label influence, the band have consistently taken charge of their own destiny. A genuine admiration has been nurtured from seeing a group of talented artists pursue their vision and make the music they want, unwilling to compromise or settle for less. Striving to uphold such a model of integrity is the best gift I could ever give myself. My family, friends, and even I could never have imagined I would end up being a Duran Duran archivist. It's certainly not a conventional pastime. However, it's one that has propelled me forward with confidence and conviction, revealing a sense of purpose in the most unexpected place. When it's easy to be drowned out by outside influences and opinions, it's good to remember that the only voice worth listening to is your own. Kirk, DDTTRH: You have an impressive collection. I especially enjoyed seeing the Rum Runner poster, the rare photography, and the postcards. Tell me, if you were to name one 'prize' piece, which is it and why? Andy: This is always a difficult question, albeit a little better than 'if there was an emergency and you had to grab one piece from your archive...'! When I think of prizes in my collection, my thoughts quickly turn to the posters I have acquired from the band's formative years. Posters from an early gig at the Rum Runner, or from when Duran supported Hazel O'Connor -- those are priceless mementos from a time that grows more distant with each passing year. When I gaze upon a promotional poster from the Rum Runner, I am filled with a palpable sense of reverence. I realize that, when this poster was printed, few people knew Duran Duran's name, what they were capable of, and who they would become. More to the point, even Duran were unaware of the road that lay ahead for them. My archive may be filled with treasures from every chapter of the band's storied career, but it's the very first chapter that sets up the rest of the story. Kirk, DDTTRH: What do you know about Duran Duran's desires to even be in the Rock Hall? I'm sure being snubbed has not sat well with the band. Andy: It's an interesting attitude that Duran have towards the Rock Hall. In my perspective, they just aren't that into garnering all the accolades and recognition, they're happy to leave all that to the fans and our enthusiastic support. They want to make great music and connect with their fans. And make money, I suppose! But that's it for them. Kirk, DDTTRH: What advice can you give DDTTRH as we wend our way forward in this amazing effort? Andy: The only advice I have is to stay true to your vision, and remember why you're doing what you do. What may seem like simple, obvious instructions are designed to ensure that you remain confident in and proud of everything you accomplish. DDTTRH is an ambitious, commendable, and impressive display of entrepreneurial spirit. I see an example of what occurs when heartfelt passion is combined with a focus and steel-willed commitment. Whether helping to orchestrate this effort or just adding their support to it, everyone involved should stand tall and know they're a part of something special. With unlimited vision and unending devotion, the possibilities are endless. Kudos for going above and beyond, Kirk. It's just what Duran Duran would do.